Custom wallpaper installations are well suited for just about anywhere in your home. The one space in our homes that none of us use enough is our dining room. With families so busy and time always in short supply, it's a wonder sometimes if you even see your family, let alone dine together. That's why we propose a custom wall mural in your dining room, in hopes that the wallpaper will be so captivating that not only meals, but homework, coffee, and socializing will always take place there. Our wall murals are always a conversation piece, and should dinner conversation grow stale, tell the tale of how your custom wallpaper installation came to be! In the inspiration room shown, we suggest using a subtle image in black and white. Black and white custom wallpaper imagery always has such a chic quality, the prefect backdrop for a formal dinner. Focusing on a more ambient image as opposed to a very busy wallpaper pattern may lend itself well to your decor. If you have a more colorful palette and accessories, go with a wall mural with more energy and presence. 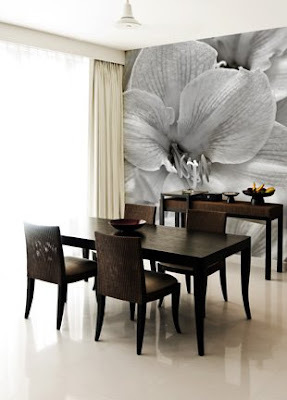 Use your own image to create a unique dining room custom mural that will be a feast for your guests' eyes. That wallpaper fits perfectly with the table and chairs around it. Thanks for sharing!